I pulled from some of my old favorites on this card by reaching for Spellbinders Antique Frames and Accents, Spellbinders Labels Sixteen and mixed in some new with Spellbinders Gold Squares One and Spellbinders Labels Thirty Two! I’m falling back in love with texture and find myself reaching for embossing folders with much more frequency – here I’m using Spellbinders Garden Lattice. Here’s your Step-By-Step Recap, from the bottom up, just in case you’d like to make one too. Start out with a cream card base cut to 5-1/2″ x 7-1/2″, foam tape, brown matting layer cut to 5″ x 6-7/8″, panel embossed with Garden Lattice embossing folder and cut to 4-7/8″ x 6-3/4″, foam tape, die cut layer using two Antique Frames glued with top at opposite ends, foam tape, die cut layer with Labels Sixteen embossed with Gold Labels One, foam tape, die cut layer with Labels Thirty Two. 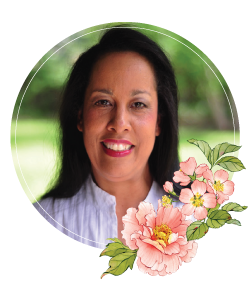 Add pearls, bow and flowers on appropriate layers. There’s always lots to see with the JustRite Design Team, stop and and take a peek! Thanks for stopping by! I hope you’ll sit down to make something for you and just let it flow! This is Gorgeous Becca, What a gorgeous colour. 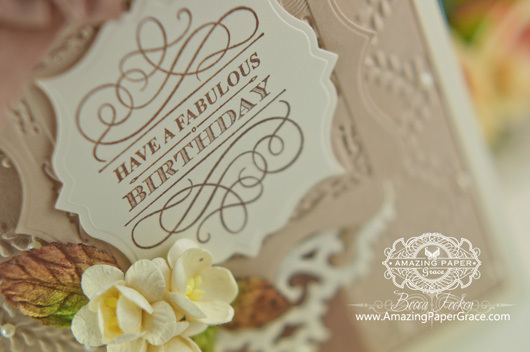 Love the Die layers and fabulous ribbon. Beautiful inspirational work as always. SUCH A NICE CLEAN BUT UPLIFTING CARD. I LOVE IT WHEN YOU USE THE BROWN TONES. THIS IS JUST SIMPLE BUT EXQUISITE!! Absolutely ……….STUNNING ………. love your bows too. Am loving the coffee and cream combo! Beautiful as always! It’s a beautiful card, Becca. I’m afraid when my mind has gone blank I just take a break for a few hours and do something completely different. But then I can afford this luxury. Must admit, it doesn’t happen often, just when I’m doing 60 Xmas cards! Oh Wow!! Absolutely stunning. Love the colours and everything about this card. I will definitely try to make one like this. Thank you for sharing. Morning Becca, I love this !! the colour is beautiful and the die-cuts are really lovely, and the sentiment stamp is gorgeous, the embossing folder is really pretty, and the bow is stunning !! I love it. 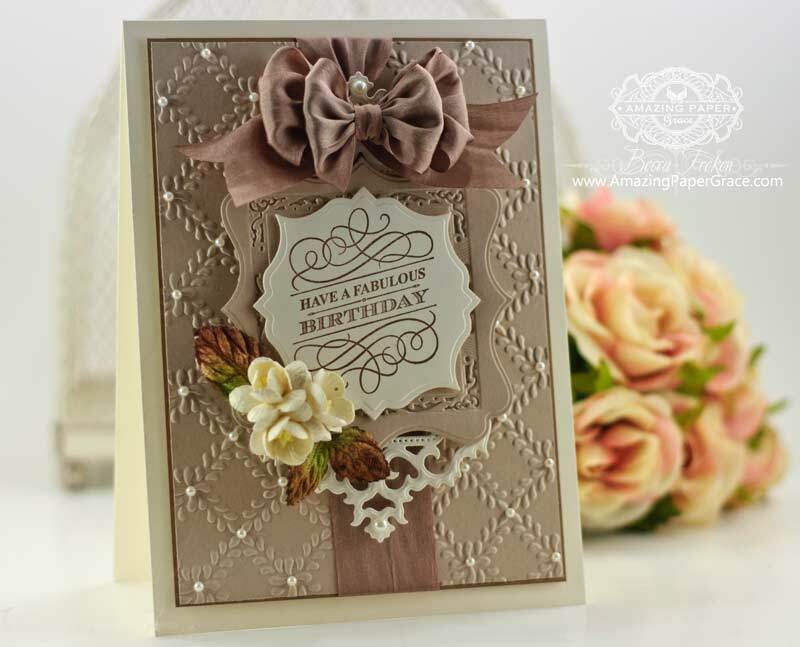 Beautiful stunning card Becca – I love the taupe and cream together – so elegant. The layers of dies are so effective. I’ve recently tried layering more die cuts on my cards and I find it makes for a more interesting finish. Thanks for all your inspiration. Hey Becca, Gorgeous card!!! I am a little bit curious though, about the paper you are using. You have the putty paper listed as EK Success??? I believe this is the second time I have seen you list it, but when I google it, nothing seems to come up. I loved this putty color, and also the peach color that you listed on a previous card. I had no idea that EK Success made card stock or any plain paper. Could you elaborate on this please. This card…..wow! So classy and elegant! I love the bow and the the multi-color leaves. All gorgeous!